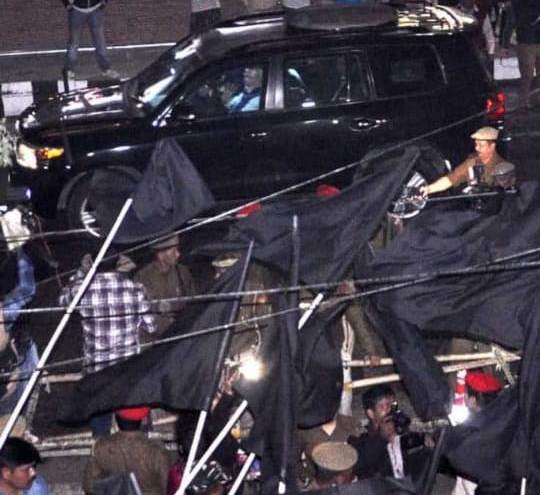 Protests against the controversial Citizenship (Amendment) Bill reached to a new level of intensity, as Prime Minister Narendra Modi was greeted with black flags after he landed in Guwahati on Friday evening. In an unprecedented incident, the students of Gauhati University mostly belonging to All Assam Students’ Union (AASU) and Krishak Mukri Sangram Samiti (KMSS) waved black flags to Prime Minister Modi near university campus in Jalukbari here when his convoy was on its way to Raj Bhawan from LGBI Airport in Guwahati. The students shouted slogans against BJP and Modi at Jalukbari, before the police could remove them from the spot. The varsity students also burnt the effigy of the Prime Minister. The AASU workers had congregated at tier office at Uzan Bazar Swahid Nyash to wave black to Modi but security forces barred them from coming out on the road. However, as soon as Modi’s convoy arrived at Latasil, the AASU workers waved black flags to him from the campus of the office of the students’ body. Meanwhile, BJP supporters also assembled on the other side of MG Road, which leads to Raj Bhawan, to greet Modi. While AASU activists shouted slogans like ‘Jai ai Asom’, ‘BJP go back’, ‘Modi murdabad’, the workers of the saffron party shouted ‘Bharat mata ki jai’ slogans. Modi arrived in Guwahati to perform Bhumi Puja for AIIMS at Changsari on the outskirts of the city and address a public rally. The AASU and KMSS have also decided to wave black flags as mark of protests in different parts of the state tomorrow when the Prime Minister is scheduled to address a public rally at Changsari. The Tai Ahom Yuba Parishad, Assam, (TAYPA) has already called for a 12 hour Assam bandh in protest against the BJP led government’s move to pass the Citizenship (Amendment) Bill 2016 in the Rajya Sabha. “We are going to protest by waving and showing black flags as mark of protest against the Citizenship (Amendment) Bill 2016 and opposing the visit of the Prime Minister. 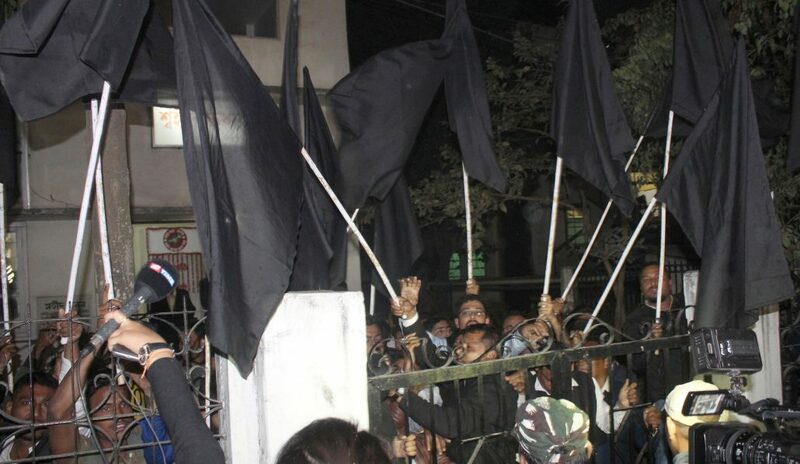 Our members will stand in different parts of the state with black flags when the Prime Minister will be speaking at the function near Guwahati,” said AASU chief adviser Samujjal Bhattacharyya. He said that Narendra Modi led government at the Centre has refused to listen to the voice of the people of Assam who have opposed the contentious Bill. “We are not going to accept the Bill at any cost and it has to be scrapped,” said Bhattacharyya. The AASU will also burn effigies of the Prime Minister and copy of the contentious Bill as mark of protest on Saturday. KMSS chief Akhil Gogoi said that members of the organization will show black flags tomorrow opposing the Prime Minister’s visit. “Our members will stand in different places across the state and protest by showing black flags. I also appeal to the people of Assam to come out wearing black badge tomorrow so that a strong message can be sent to the BJP led government,” said Gogoi. Meanwhile, the Asom Gana Parishad (AGP) also took out a candle light procession against the Bill and opposing the visit of the Prime Minister in Guwahati on Friday evening. “We warn the BJP led government at Delhi and Dispur to take a decision considering the voice of dissent of the people against the Bill,” said AGP president Atul Bora.